Plan: Lot of great images I had seen about rain captured through the car windshield and drops were giving good effect. Story: This year the rain is not that plenty and if it was raining I was not in my car. 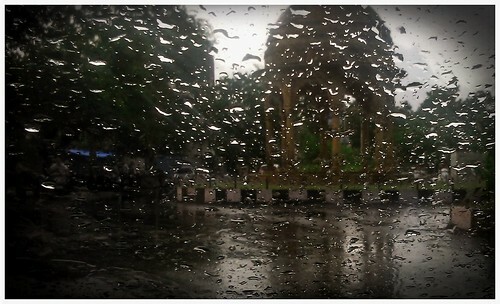 This fine day I was in the car and it rained so picked up my mobile (the only available camera) and clicked this shot. Before doing that got near an interesting traffic island parked the car on one side and waited for traffic to be out of the island. Learning: Use any available camera if you like the frame. Some post processing can always improve the image.